The quality and depth of Purdue’s Alumni Network consistently helps Boilermakers advance their careers. Whether you’re hunting for your first job, changing positions mid-career, or hoping to make professional connections worldwide, utilize your Alumni Network. 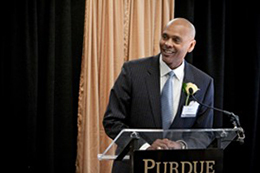 Explore our alumni, read the latest Krannert Magazine, and find out more about Purdue’s Krannert School of Management.